It worked 4 days ago. The only thing that I have changed in the solution is the version number in the manifest. Starting/debugging the application from visual studio works. There is currently some issue going on at Microsoft's end(across most regions) because of which you are not able to install app in App Catalog. 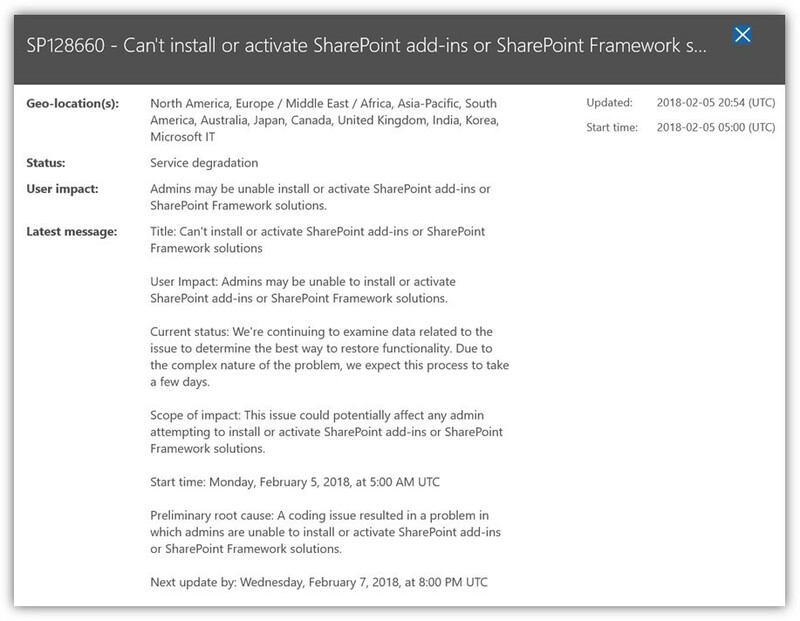 This is affecting both SPFx solutions as well as SharePoint addins (Provider-hosted and SharePoint-hosted). Nothing you can do at the moment. Check your service health status -> Health -> Service health -> SharePoint online advisory (need global admin credentials). This is going on since yesterday night I guess. Wait till tomorrow for further update. Not the answer you're looking for? Browse other questions tagged sharepoint-online sharepoint-addin error spfx provider-hosted-app or ask your own question.